I am so sad that my #jensfillerblocks series is coming to an end. I have one, maybe two more posts planned and them I’ll be sad every Friday that I don’t have a need to share 6″ blocks any more. 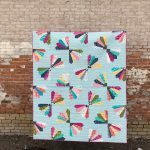 I just finished up the last of my 144 6″ blocks for my mega sampler quilt yesterday!! 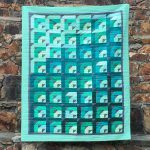 This duck tracks block for today is another fun traditional block that can be changed and made to look more modern just based on fabric choice. It comes together rather quickly as well. Win win for everyone. Start by drawing a line down the diagonal center of (4) 2″ x 2″ white squares and (2) 2-3/8″ x 2-3/8″ white squares. 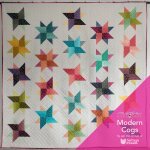 Pair these (4) 2″ x 2″ squares with the 2 aqua and 2 pink 2″ x 3-1/2″ rectangles, making sure the line is oriented in the correct direction using the above finished block for reference. 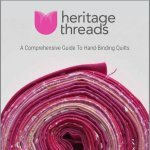 Sew down the drawn line, trim off the excess, and press. 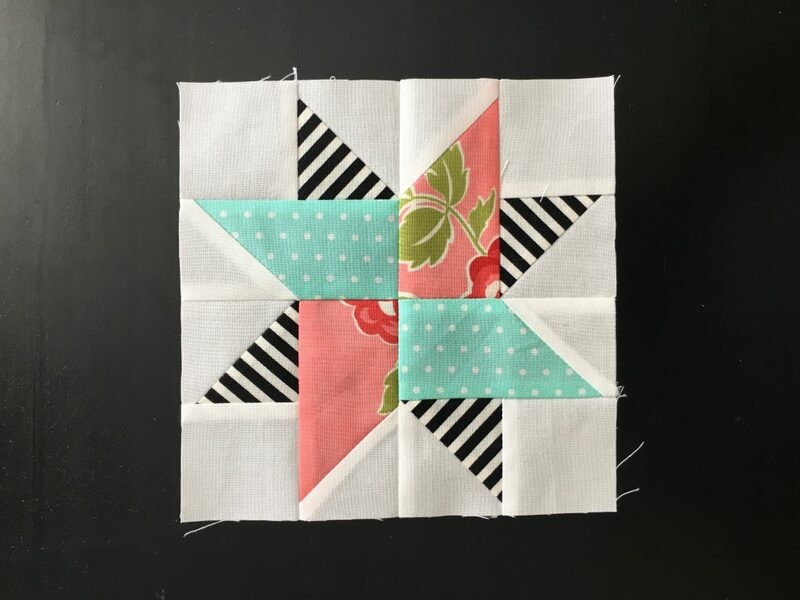 Pair up the white 2-3/8″ squares with the black 2-3/8″ squares. Sew 1/4″ away on both sides of the drawn line. Cut down the line, press the pieces and it will yield 8 half square triangles (HSTs). Trim these to 2″ if necessary. 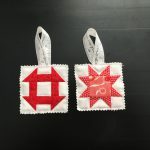 Lay out each quarter of the block, sew the quarters together. They should measure 3-1/2″ x 3-1/2″ at this point. 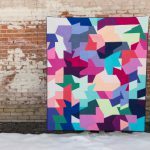 Sew together into halves, then into your complete block.